Here you can see the levels of Super Saiyan that were only achieved by Broly. This section tells the differences between Broly's forms and the regular Super Saiyan forms. This is the weakest of all Broly's forms and is a slave to his father Paragus, thus he cannot fully maximize his Super Saiyan potential. This form is first awakened by Goku when Broly first sees him in DBZ Movie #8. However, this form does not last when Broly breaks free of Paragus' control. When Broly is free he is able to release his full power. Once Broly is free from Paragus, he can turn into a true Super Saiyan. This form is identical to Super Saiyan 1. Granting Broly the usual power and speed increase just like any other super Saiyan would receive. 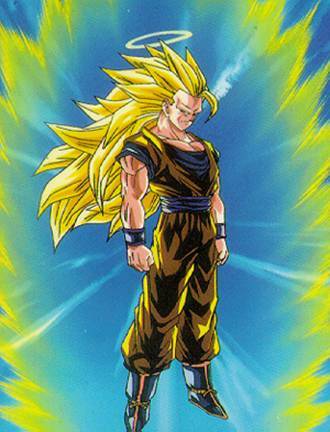 This form is very similar to Super Saiyan 3rd Grade (Ultra Super Saiyan), but is not the same. In this form Broly's muscle mass increases greatly, but he does not suffer any loss of speed. This form is actually closer to Super Saiyan 2, but is not that either due to the muscle increase.